On August 28, just two days from now, Realme 2 will launch in India. We have already seen the reviews leading to the launch of Realme 1. Although the Realme 2 has not been officially announced, there are specifications spreading online at the moment. At the moment, Realme 2 has been seen on Flipkart and a few other places online with its expected specifications. Rest assured this guide is to help you make buying decisions. Realme 2 features a notch over the display and this helps to accentuate the #ANotchAbove hashtag. The smartphone is a 6.2-inch screen size mobile phone, with body dimensions such as 156.2 x 75.6 x 8.2 mm. The information about the weight is still a bit sketchy but expect it to have a ‘normal’ cell phone weight that most modern smartphones boast of. The Display type is IPS LCD capacitive touchscreen of 16M colors. The device has an 81.2% screen to body ratio. A resolution of 720 x 1520 pixels, which translates to 19:9 ratio, which in other words signify 271 pp1 density means that the Realme 2 is a mid-range smartphone. Furthermore, the fact that Realme 2 has the capacity for multitouch is a small wonder in itself, for one would not expect that from a smartphone of this level always. The device is available in red, black, and blue color variants. The back of the Realme 2 smartphone resembles the diamond cut pattern that is seen in its predecessor Realme 1, the one that was released in the month of May 2018. Though it’s not known if the front camera could have AI-backed features, to the rear, there is some sort of vertically stacked dual rear camera. The main camera, which is to the rear is 13 MP, f/2.2, AF plus 2 MP, f/2.4 depth sensor, LED flash, HDR, panorama attributes. The single selfie camera to the front is 8 MP, f/2.2 AF. Sure enough, both the front and the dual rear cameras are capable of handling moderate quality videos of 1080p@30fps. Of course, like every other smartphone, you can expect the Lock and Unlock features in Realme 2. But as seen online in pictures provided by the manufacturer, Realme 2 has the fingerprint sensor to the back and could come with face unlock features. Apart from face unlock feature, the device has a SmartLock feature which goes along with the fingerprint reader. The Realme 2 smartphone is being released at a crucial time. It comes at a period when the company is breaking ties with Oppo, the smartphone company that collaborated with Realme to manufacture Realme 1. Now, we know that Realme will announce Realme 2 on its own new and dedicated platform as Realme jus severed operations with Oppo. In this way, Realme 2 is the first official smartphone released on the stable of Realme. Realme 2 Operating System (OS) is Android 8.1 Oreo, Octa-core 1.8 GHz Cortex A53 CPU, and Adreno 506. Qualcomm has relayed the message that Realme runs on Snapdragon 450 SoC chipset. These aspects are responsible for giving users a spectacular performance, ultrafast speed, and astonishing graphics. 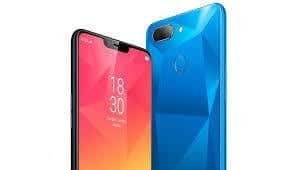 Analysts are already thinking that if it is so, then Realme 2 is in some aspects a downgrade from Realme 1 which runs on Helio P60 processor. There’s the 4GB RAM for 64GB storage or 3GB RAM for 32GB that can both be increased up to 256GB. Realme 2 is equipped with a non-removable Li-Ion 4230 mAh battery. There’s power here to any big time user. You can depend on having adequate power throughout the day on a single battery charge. Realme 2 network is GSM, HSPA, and LTE. Expect the device to make use of 4G and Wi-Fi 820.11 /b/g/n, Wi-Fi Direct and hotspot. There is a Bluetooth 4.2 available. The GPS capability comes with A-GPS, FM radio, micro USB 2.0, and USB On The Go. Other extra features accompanying the rear-mounted fingerprint sensor include an accelerometer, proximity, and compass. Realme 2 will sell for the same range that Realme 1 sold for at the release date, which was $128. At most, the price of Realme 2 should still hover below the $150 level. As soon as it is released on August 28, we expect it to arrive in online and offline stores a few days later.